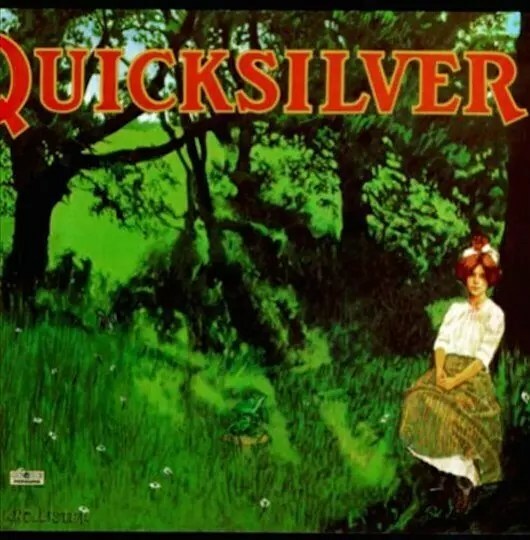 The Quicksilver Messenger Service were a wild quartet of jamming longhairs whose finest hour would come on the album released in 1969 Happy Trails. With an evocative cover designed by the Charlatans’ George Hunter, that live album caught the intense and almost dangerous quality of San Francisco’s late Sixties sound. Grounded in the primitive stomping of drummer Greg Elmore, the interplay between Gary Duncan’s chugging rhythm guitar and John Cipollina’s quivering lead lines was thrilling and hypnotic. They put off signing with a label for years to avoid the pressures of touring and consequently getting rushed by record companies into making albums not up to their own standards. Living on a ranch north of San Francisco in high style with their ladies, grass, guns and living out their space cowboy trips, QMS also benefited greatly from an abundance of local gigs they picked up in the absence of The Airplane or The Dead, whose unavailability was due to national tours and out of town engagements. And it was through this constant stream of live performances that afforded them the opportunity to tighten up every loose end in their repertoire while stretching out musically and evolving their sound beyond any reasonable set of expectations. One of the most revered psychedelic bands from the 1960s and 1970s the great Quicksilver Messenger Service bossed the Bay Area as a live act in the hazy daze of acid rock. Alongside their friends and rivals the Grateful Dead, Quicksilver epitomised the free form sound of a heady era with the twin guitar attack of Gary Duncan and John Cippolina mixing up vibrato, reverb, finger picking and some of the most influential experimental passages in Californian rock – both men being West Coasters through and through. Co-founding member Dino Valenti (from Connecticut) brought in his own unique folk bag style, learnt in the coffee houses of Berkeley and New York City, and he introduced a blend of gothic traditional and beatnik poetry that made the group unique. With the added bonus of a dynamic rhythm section – David Freiberg’s sonorous bass welded to Greg Elmore’s metronomic punchy tom tombackbeat, this bunch of sharp looking hombres became regulars in Bill Graham’s Fillmore Scene as well as the Carousel and Avalon and slayed crowds at every major club and ballroom and outdoor festival they graced. They also left behind a quite splendid body of recorded work and also used the studio to mix live and pieces into their sound – especially on the classic Happy Trails – which gave them a wraparound sonic groove that has never dated. Their career spans 1965 to this very day since Freiberg and Duncan still go out to thrill crowds as QMS. Always an outfit for the West Coast aficionado they have never really received the appropriate accolades, bells, gongs and whistles of others but that doesn’t matter because their music reigns supreme. Side 2 is more measured but equally inventive. Diddley’s ‘Mona’ kicks things off now and white boy blues doesn’t come any sharper. Duncan’s ‘Maiden of the Cancer Moon’ and ‘Calvary’ are atmospherically charged and comparable to Ennio Morricone. All manner of percussive devices are employed and the vocals are damn fine to boot. Long considered a must have classic of the era we see or hear nothing wrong with that judgement. Fact, we love this album so much we’ve just stuck it on again! As the 1970s signalled changes in personnel and a new mood in the air Quicksilver took stock and branched out with both Duncan and Cippolina embracing solo projects like the magnificent offshoot band Copperhead and Freiberg throwing in his lot with his old pals in Jefferson Airplane and then Jefferson Starship, although they all continued to play impromptu shows with their kindred soul brothers in the Dead. Often described as hippies with rifles this lot knew about image but their music flowed organically. They still sound like Messengers from the gods. It’s an album that’s also of interest to Rolling Stones fans, because from this third studio release onwards, the band’s personnel was enhanced by the arrival of one of the most in-demand keyboard players of his generation, the late Nicky Hopkins. His presence, which also included work on harpsichord, cello and celeste, was an admirable addition to the band’s existing sound, based on the guitar and vocals of John Cipollina and the viola, bass, guitar and joint vocals of David Freiberg. Greg Elmore added percussive inspiration. QMS had debuted with a self-titled album in 1968 that complemented the experimental rock milieu of the day, and made some chart inroads, peaking at No. 63. Their first top 30 showing came with that ‘Happy Trails’ follow-up at No. 27. ‘Shady Grove’ went a little higher, at No. 25, after which ‘Just For Love’ peaked at No. 27 and ‘What About Me’ No. 26. It was a remarkably consistent run, all achieved by four releases inside a two-year span. ‘Shady Grove’ was, again, the work of a band confident that their audience would make an adventurous sonic journey with them, even if they were in the process of moving from their psychedelic beginnings into a more pop-oriented sound. Cipollina and Duncan exchange solo and rhythm duties on “Happy Trails” so effortlessly that despite the production’s extreme stereo separation (Duncan on the left channel, Cipollina on the right) it’s never anything but a seamless series of intuitively placed fits of opposing forces with an undying attraction to each other. At times Duncan’s rhythm is a fat, toned-down punk buzzsaw working as a wash against Cipollina’s agile counterpointing and sometimes Cipollina’s solos are the smallest of strategic rhythmic strokes while Duncan’s rhythm playing at times appears more like solos rendered in shorthand. These free-flowing qualities were accented with carefully controlled, soaring feedback and stinging arpeggios of the purest tones. These numerous and spectacular displays of twin guitar exchanges are supported by the impeccably synchronised rhythm section composed of David Freiberg on bass (and accompanying brusque vocals) and the perfectly restrained drumming of Greg Elmore. This backing was uncluttered and tough enough to allow the group’s paces to ebb or flow at a single moment’s notice: as gracefully evident in the manner in which “Who Do You Love” constantly shifts, unfolds and turns into passages both reflective and active. By the time they reach the middle passage (subtitled “Where You Love”) they’ve brought it all the way down to so the guitars are now more a cross-stitching of muted, across the bridge picking approximating the tinkling of mechanical chimes. Volume control knobs on guitars are tweaked to neatly stagger the otherwise feedbacking sound signals into blocks of zapping noise. A wafting current of slight feedback tilts into the near-quietude as the appreciative Fillmore audience starts clapping along in time with the bass drum, and soon it’s all panning from speaker to speaker: yelps and cries from the stage and audience until what was once Bo Diddley has now been reduced to the simplest elements of communal grooving and joy AND the group are in no hurry to fall back into the song until the last grunt, handclap and cry has been squeezed out. But they do when Cipollina tears a single, screaming note outta his SG with a twist of Bigsby whammy bar to signal the lurch into the breakneck pace of “How You Love”: a showcase of his quickly incisive and multi-directional arpeggio’d notes that scatter and flee to all four corners of the Fillmore but always regroup back into the ever-ascending main riff. After they cool off during Freiberg’s bass solo spot, they’re quietly circling back over “Who Do You Love” proper. All is simmering until they finally decide to go for broke one final time. Before they hit a final cluster of building crescendos, Freiberg and at least two other members have been vocally going for it by yelling bits of the lyrics over the tumult of guitar riffs and Elmore’s now constant swish of cymbals. But after a series of short solos and heat-generating noise and whining feedback, it elegantly drops off…to roars of applause.